This German release is a remixed "New Single Version" (3:31). The two track single includes the "Demo Version" of "Mother Nature Goes To Heaven" (4:34). It was released to German stores on 16 October. A one track download of the single was available in Norway on 14 September. A two track download of "Shadowside" was available in the UK on 7 November. The UK download includes the "New Single Version" (3:31) and the album version (4:54). The cover art features a snowy mountain-scape on the front and inside of the insert. 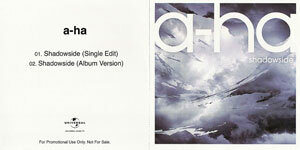 A large white a-ha logo is printed at the top of the front sleeve with the title below. The track information is printed in white on the inner side of the insert. 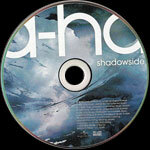 The disc also has a picture of the snowy mountain-scape printed on it with the a-ha logo and title printed at the top. There is silver sticker on the front of the case with some of the German tour dates printed in black. 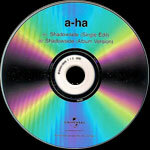 There is a two track promo CD single of "Shadowside" which comes with a paper insert in a PVC wallet. The cover artwork is similar to the German CD single. The reverse of the insert is white with the tracks listed in black. The disc is silver with black text. On the reverse of the PVC wallet, there is an orange "HESSO MEDIA" sticker with info on the band and contact information. The sticker claims that the single was released on 30 November, but it was actually released much earlier than this. The two tracks are the same as the UK download, even though the first track is listed as "Single Edit". The German 1-track promo was used in Israel and comes with a white sticker with black text on the front. There is a one track promo of "Shadowside" which has a white vinyl label with black text. It comes in a PVC wallet with no insert. It features the album version (3:32). Germany (Israel) promo Shadowside (New Single Version) ? Universal Music ?